[Lord Caitanya protested against being called the Supreme Lord, and He said, “My dear sir, I am an ordinary living entity. I cannot know the real meaning of Vedanta-sutra, but Vyasadeva, who is an incarnation of Narayana, knows its real meaning. No ordinary living entity can interpret Vedanta-sutra according to his mundane conceptions. In order to curb commentaries on Vedanta-sutra by unscrupulous persons, the author himself, Vyasadeva, has already commentated upon the Vedanta-sutra by writing Srimad-Bhagavatam.” In other words, the best explanation of a book is written by the author himself. No one can understand the author’s mind unless the author himself discloses the purpose behind his writing. Therefore Vedanta-sutra should be understood through Srimad-Bhagavatam, the commentary written by the author of Vedanta-sutra. Pranava, or omkara, is the divine substance of all the Vedas. Omkara is further explained in the gayatri mantra exactly as it was explained in Srimad-Bhagavatam. 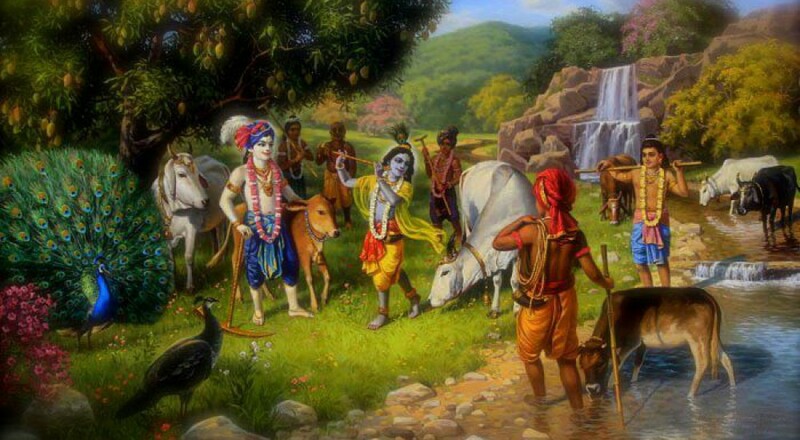 There are four verses written in this connection, and these are explained to Brahma by Lord Krsna Himself. In his turn, Brahma explains them to Narada, and Narada explains them to Vyasadeva. In this way the purport of the verses of Srimad-Bhagavatam come down through disciplic succession. It is not that anyone and everyone can make his own foolish commentaries on Vedanta-sutra and mislead readers. Anyone who wants to understand Vedanta-sutra must read Srimad-Bhagavatam carefully. Under the instructions of Narada Muni, Vyasadeva compiled Srimad-Bhagavatam with the purpose of explaining the Vedanta-sutra. In writing Srimad-Bhagavatam, Vyasadeva collected all the essence of the Upanisads, the purpose of which was also explained in Vedanta-sutra. Srimad-Bhagavatam is thus the essence of all Vedic knowledge. That which is stated in the Upanisads and restated in Vedanta-sutra is explained very nicely in Srimad-Bhagavatam. There is a passage in Isopanisad similar to a verse found in Srimad-Bhagavatam (8.1.10) which states that whatever one sees in the cosmic manifestation is but the Supreme Lord’s energy and is nondifferent from Him. Consequently He is the controller, friend and maintainer of all living entities. We should live by the mercy of God and take only those things which are allotted to us. In this way, by not encroaching on another’s property, one can enjoy life.